Newborn hamsters of all types begin their existences in highly dependent states, lacking both vision and fur. Despite this powerless start in life, a hamster's development is extremely fast, and before you know it, the little rodents are completely weaned and heartily chowing down on commercial hamster formula. Wee hamsters typically start taking in solid, dry hamster foods when they're about 10 days old. This is when the weaning process commences. As with many other animals, weaning entails the gradual transition from exclusive nursing with the mama hamster to eating only "normal" foods." Although baby hamsters start eating hamster foods when they're just days old, they still continue to nurse with their mothers for a little while longer. Dwarf hamsters -- like Chinese and Campbell's hammies -- typically are all through with weaning once they get to roughly 3 weeks old. The process doesn't move as fast with Syrian hamsters, however. Many Syrian hamster youngsters wait to be fully weaned for almost a month. Typical weaning age for Syrian hamsters is between 26 and 28 days old. Before you give baby hamsters their earliest servings of hamster food, make a point to immerse the pellets in water beforehand. By doing this, you give the food a smooth and soggy feel, and therefore make it easier for the little guys to eat them initially. Note that putting these pellets on the floor of their living space offers the young hamsters easy access, too. Baby hamsters also need to have clean water always available to them. Once they're old enough to eat hamster food, they need to be regularly drinking water, too. When setting up the bottled water in the hamsters' cage, make sure that the wee ones can comfortably get to the bottles' tubes. Make sure too that the tubes don't touch the hamsters' sleeping area. Clean water is vital for young and adult hamsters alike. 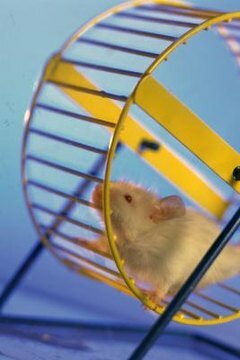 When planning your hamster's mature meal plan, look not only at commercial hamster foods but also at produce. Discuss with your veterinarian supplementing your hamster's diet with small and controlled amounts of fresh produce, both vegetables and fruits. Never offer your hamster any specific vegetables or fruits unless you're 100 percent sure that they're hamster-safe. Seek your vet's OK before introducing anything new into your pet's menu. Also ask about suitable commercial treats that are made for hamsters.